The City of Watauga, Texas, in compliance with Federal and State laws, maintains an active backflow prevention department and program. All backflow devices and backflow preventers must be inspected annually to ensure their safe operation and to ensure a safe potable water supply. 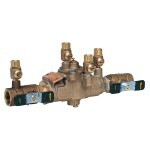 City Backflow Testing offers affordable backflow testing in all cities in the Dallas/Ft. Worth area.